This article was originally published at http://www.milwaukeeindependent.com/featured/activating-macarthur-square-space-never-lived-purpose/ and was written by Dominic Inouye. The first time my fitness group announced that we would be working out in a brand new space, MacArthur Square, I was not the only one who posted on Facebook, “Where?” GPS told me it was tucked in between the County Courthouse, the Milwaukee County Jail, the Safety Building, the Milwaukee Public Museum, and the police headquarters. But after I found parking on James Lovell Street, I had no idea how to get there. I was introduced to the space by November Project (NP) Milwaukee, the fitness group I have been a member of for the past four years. An international movement of over 40 cities that began in Boston, NP uses the city as its gym, gathering every Wednesday morning, year-round at 6:26 a.m., to box jump onto park benches, Burpee along waterfronts, sprint up stairs and hills, and partner sit-up on downtown sidewalks. In Milwaukee, our Wednesday meet-up is always at Mark di Suvero’s orange sculpture “The Calling” in O’Donnell Park, in the shadow of the new Northwestern Mutual Tower and within feet of the sunrise-drenched brise soleil. We gather in sunshine, rain, or snow. Our tribe, as we call it, also works out on Fridays, alternating between seventeen other locations: as far north as Atwater Beach, as far east as Bradford Beach, south to The Domes and west to Washington Park. Other favorite spots in between include Kadish Park, the Riverwalk at the Bronze Fonz, Lake Park Bistro, and MacArthur Square. When I got out of my car that first day, there was no park in sight. However, I followed some of my shorts-clad tribe members as they sheepishly walked up an unmarked spiral ramp in the dark, hoping that it would lead to someplace called “MacArthur Square." Almost six decades before my first encounter with MacArthur Square, urbanist activist Jane Jacobs wrote in her 1958 Fortune Classicarticle Downtown is for People about the myriad downtown projects emerging around the country, in San Francisco, New Orleans, Nashville. Such a cemetery exists in the heart of downtown, but I would not call it “well-kept” or “dignified.” Jacobs could have been describing Milwaukee’s MacArthur Square. The square’s creation was many decades in the making. In 1929, the city finally connected Biddle and Cedar Streets with a bridge, which extended east and west on opposite sides of the Milwaukee River. The long boulevard was renamed Kilbourn Avenue. Two decades earlier, architect Alfred Clas, who headed the newly established Metropolitan Park Commission, began dreaming of a grand civic center with a wide boulevard that would connect City Hall on one side of the river to a grand new county courthouse. New civic buildings would line the boulevard. Today, Kilbourn Avenue to the west and east of City Hall also boasts Pere Marquette Park (established in 1975), Red Arrow Park (1984), Cathedral Square (1939) and Juneau Park (1887), a string of parks that could have extended Clas’ grand vision all the way to the lake bluff. But it was not to be. Clas and his commission were inspired by the popular City Beautiful movement, the same one that resulted in our National Mall, with its emphasis on the orderly arrangement of civic buildings, monuments, and parks flanking long and broad boulevards. If Jacobs had lived in Milwaukee during the early part of the century, Clas might have been her Robert A. Moses. It is interesting to note that the Clas Commission looked to the densely populated neighborhood between 10th and 6th Streets, Wells and State, to develop their dream. According to local historian John Gurda, the neighborhood had all the characteristics of an eclectic, hustling-and-bustling downtown. Since 1865, it had been home to everything from the stately Congregation Emanu-El B’ne Jeshurun synagogue, a coffin shop, livery stable, and a panorama painting studio. The area also hosted many multifamily residences which were eventually joined by cheap hotels and apartment buildings, and even more industrial buildings. After decades of increased density, the space began to show some wear and tear. The solution to Clas was a simple one: raze the blight and build up the City Beautiful. However, it would take more than two decades for the crowning jewel, a gargantuan new county courthouse, to take its place on the western skyline. On that first NP morning in the square, an expansive and three-level plaza awaited us. At the lowest of the three levels, a pool almost the length of a football field jutted out from the police station. 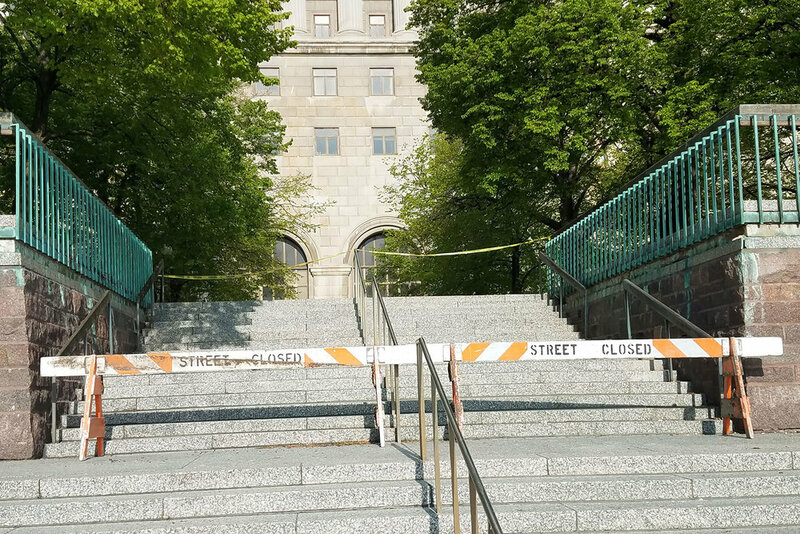 On the bigger second level, red-gravel paths divided four rectangular lawns, which were flanked by neatly trimmed bushes, two wide sidewalks leading toward the courthouse, and plenty of park benches. Up a long set of stairs to the third level, a triangular lawn revealed a statue of Mahatma Gandhi at its apex. His eyes, weary from marching, still determinedly fixed straight down Kilbourn Avenue towards the City Hall. The sunrise revealed the square’s loneliness. The dried-up pond, the litter, the sleeping bags of homeless citizens. We all left our NP blood, sweat, and tears in MacArthur Square that morning, after long sprints, box jumps and leg throwdowns, but most of us – including myself – still knew nothing about why the square existed. Did anyone use the space during the daytime? Not necessarily for sprints like we did, but even just strolling or lunching, casual meetings, or relaxing games of frisbee? I would encounter MacArthur Square in a different way, and while wearing regular street clothes, months later. I led my first Jane’s Walk in 2017, called the Art & Justice Trail, that linked Bronzeville to Clarke Square via the James E. Groppi Unity Bridge. Among other sites along the way, the walk connected the statue of Martin Luther King Jr. in Bronzeville to the statue of Cesar Chavez in Clarke Square. At the halfway point was Gandhi, which most people on the tour had never seen. It was on this tour that I first introduced the walkers to what local historian John Gurda has called “the black hole of downtown Milwaukee… sucking the energy out of its surroundings.” He further bemoaned the square as an “oversized alley, owned by no one, used by no one, loved by no one.” Other than our group of tour participants, the square was empty. Again, why had this happened? And what could be done to reactivate the space for public use? When the Depression hit, no new civic center projects followed. After World War II ended, the city did name the plaza MacArthur Square to honor the general who called Milwaukee his “old hometown.” Six years later, General Douglas MacArthur himself visited the city with a great deal of pomp and circumstance. He concluded a thirty-two mile victory lap around Milwaukee with the official dedication ceremony of the square in his honor, witnessed by an attending crowd of 40,000 people. Then, the beginning of the end arrived. The 22.5-acre square became the roof of a 1,445-spot underground parking garage. The Milwaukee Public Museum on Wells Street blocked the square from view facing north, with the Safety Building blocking it from view on the State Street side. Then the Police Administration Building was erected. Neither the Schoenleber clock tower, nor the city Christmas tree, nor the statue of MacArthur finally erected in 1979 could attract more than occasional concerts or rallies to the square. A recent excursion also revealed a modest monument I had never seen before, dedicated to Milwaukee police officers killed in the line of duty up until 1977. It sits unceremoniously near a desiccated pool amid benches, litter, and bushes with sleeping bags tucked behind them. Thirteen more officers have died in the line of duty since 1977. We cannot forget the recent rallies and marches that began in the square, bringing thousands to the space to fight for women’s rights on January 20 and a couple hundred to fight for marijuana legalization on May 5. But the marches came and went. Today, the 22.5-acre park is as empty as ever, except for a some geese, other wildlife. A handful of homeless individuals, some pitching tents in the middle of the lawn, others curled up in sleeping bags in the low bushes or even against the police building, are the only people who frequent the space. 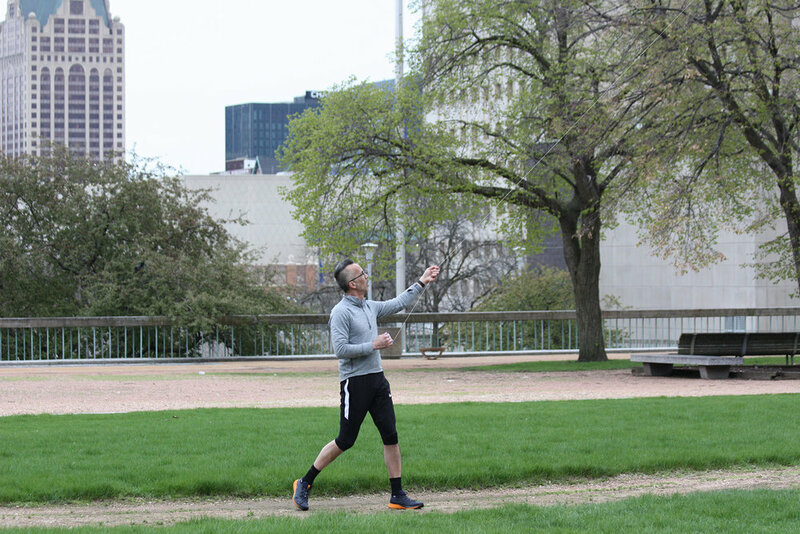 On a recent Saturday afternoon, as part of Jane’s Walk MKE, I offered residents a chance to help activate the space in a seemingly new way: learning some history, then play kickball and fly kites. I encouraged anything to use the space that was available to us. The weather forecast promised spring rains but had held back, and about a dozen brave souls took a chance to join me. We had time to entertain ourselves with various forms of recreation while we waited for everyone to arrive. But as my short history stroll around the square was coming to an end, a loud thunderclap shook above us – and the rain came. Huddling under some tree cover, we agreed to reschedule and before we left, we shared last-minute ideas for how to activate MacArthur Square. To be fair, city officials in 2006 worked with Robert Greenstreet, architect and Dean of the University of Wisconsin-Milwaukee School of Architecture and Urban Planning (SARUP), who asked Larry Witzling of the Planning and Design Institute Inc. and a University of Wisconsin-Milwaukee School of Architecture and Urban Planning graduate student, Franz Heitzer, to consider ways to transform the space. Their two-day charrette resulted in a space with commercial development and various housing options, including condominiums and Milwaukee Area Technical College dormitories. 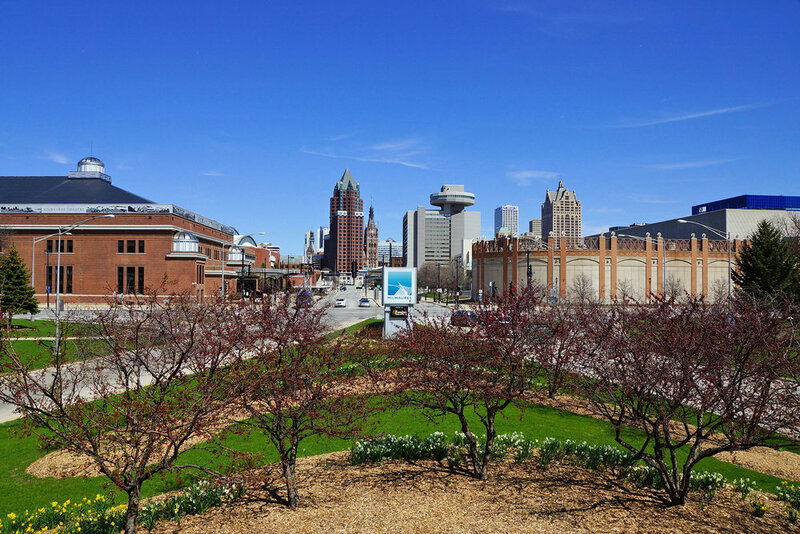 Among other things, the proposal called for two bridges to connect Kilbourn Avenue to the park, as well as other ways to better integrate the square to the street grid. The plan eventually proposed to the city in 2009 would have redefined the park space, reducing it by almost half. But the proposal’s hope of moving the entrance to the courthouse to the east side of the building would have highlighted its usefulness. The article, published in the 2015 book SynergiCity: Reinventing the Postindustrial City, remains hopeful that in the future city officials will not ignore innovative possibilities for public spaces. For now, Milwaukee County is still considering costly, piecemeal plans: demolishing the Safety Building and building a ten-story Criminal Justice Center, renovating the County Courthouse, repairing the leaking parking structure that also needs an improved HVAC system. It seems time again for a holistic development plan that considers the entire courthouse complex, including the museum, police structure, the street grid, and MacArthur Square. Like Greenstreet, I remain hopeful but only because the drenched participants in the failed kickball event imagined possibilities outside the realm of development that would cost hundreds of millions of dollars. I have no doubt that MacArthur Square and its surrounding buildings will eventually be transformed somehow, for good or for ill. What to do with the space in the meantime, remains a question with few answers. Some suggestions saw the possibility for outdoor movies and concerts. Other ideas involved food and beverage trucks. I have wondered lately if small festivals like Fringe Fest – currently held at Pere Marquette Park in August, MKE Festival of the Arts – also slated for August, or Oktoberfest could draw attention to the square. In fact, according to their website, local restaurateurs Craig Pruscha and Hans Weissgerber III are planning to move Milwaukee’s Oktoberfest from Pere Marquette Park to MacArthur in 2018, so this could be a start. Someone else brought up the notion of using part of the square for a downtown dog park. While Claude Krawczyk and the Downtown Neighbors Association of Milwaukee, Inc. (DNA MKE), have been trying to persuade the Bucks to create a playground and dog park on the site of the soon-to-be-torn-down Bradley Center, gathering over 300 signatures so far on their petition, just two blocks west lies MacArthur Square waiting for someone to breathe life back into it. The site is large enough to host a dog park, a people park, a children’s park, public art, a wading pool, and more. Especially in warm months, downtown dog owners would have a space to gather. Patrons and programs of local institutions could spill out onto the square to relax or learn. A splash pool and nearby playground equipment could provide an alternative to expensive water parks for residents in nearby neighborhoods. The dreary backside of the museum could sport a massive Wisconsin-themed mural. Stair risers could be painted to resemble beloved book spines, a tribute to the library across the street, or justice-related quotations. Permanent and traveling sculptures could also punctuate the empty space as an offshoot of the Wisconsin Avenue project. A pay-as-you-can outdoor cafe near the monument to fallen officers could provide service to an assortment of visitors. The library across the street could host outdoor summer events in the square. And the Public Museum could also seek ways to use the square during their summer camps. As for access, without having to build expensive pedestrian bridges from Kilbourn Avenue over 7th Street, the hidden spiral staircase could be spruced up. A new coat of paint in the same color could be used as a visual merger with the sidewalk, leading from Wells Street into the park. I talked to someone recently who even suggested a socially conscious approach, by building tiny homes on the property for the homeless. That would probably require some rezoning. But imagine if a commitment to the city’s homeless stood, as tiny homes circling a community garden, under the shadow of the courthouse emblazoned with the words “Vox Populi, Vox Dei.” The square would become a square for the people, by the people. MacArthur’s statue was relocated four years ago. So the space could be renamed to help its image. Calling it “The People’s Square,” for example, would appoint it as the place where people gather to have their voices heard. Citizens could make the square what they want it to be, when they want it to be. A mixed-use Milwaukee agora, like the ones in ancient Athens for commerce, arts and education, athletics – like kickball and kites. Political marches could begin at “The People’s Square” and commence toward City Hall, or vice versa. Imagine any kind of use for the people, by the people. How can new buildings or projects capitalize on the city’s unique qualities? How can the city tie in its old buildings with its new ones, so that each complements the other and reinforces the quality of continuity the city should have? Can the new projects be tied into downtown streets? Does new building exploit the strong qualities of the street—or virtually obliterate the street? Will the new project mix all kinds of activities together, or does it mistakenly segregate them? Some of our ideas sound fantastical, some practical. Most of them will require some amounts of money. Some just require getting our collective butts into the square and using it in new ways, or urging the adjacent library and museum to consider innovative ways to activate it. The more MacArthur Square is used, the more it will become The People’s Square.